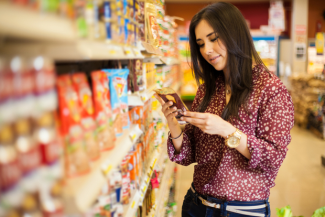 Although many feel ‘judging a book by its cover’ does not reveal the true nature of any product, the reality is that many consumers identify with labels when making the decision to purchase. In a study by Simone Mueller and Gergely Szolnoki* on the impact of labelling and packaging on market price, it was revealed – after studying the habits of 521 German wine drinkers – that branding and labelling have the biggest impact on consumer’s buying choices. To begin with, there are a wide variety of label types and purposes, these range from price marking labels (to display price), sheeted labels, blank labels, (which can be printed with any design), product packaging labels, (used for labelling a product), barcode labels (used for displaying a products barcode, read more about Barcode Labels here), computer sprocket punch labels (used in dot matrix printers) and more. View examples of various label types here. This is important to know as not only are labels used for the above practical purposes, but they also play a fundamental role in swaying the buying power of consumers in a certain way. As was evidenced in Mueller and Szolnoki’s study, the power of labels in driving consumer purchases cannot be underestimated. A product label can literally be the deciding factor between a customer choosing your product or any others on offer. From the Simba Chips Lion, to the instantly recognisable red and white Coca-Cola beverage, a good brand name always has an iconic label attached. Elements such as a unique font, attractive colours and interesting patterns or icons all work in a company’s favour. It’s important to find the unique balance between making your product label stand out but keep the brand integrity attached. Consumers want more from their products than merely what meets the eye. This is where affiliation with organisations charged with instilling accountability is becoming far more important. Consumers are now looking to support local industry which means checking the label for the colourful tick denoting its ‘Proudly South African’ commitment, or ensuring no animals were harmed in the making of the product, so that little bunny on a cosmetic label – indicating Beauty Without Cruelty – could be the deciding factor when it comes to product selection. Although a company may be selling the best the market has to offer, without the necessary labels to capture consumer attention and retain it with useful details, the product will not move off the shelves. Once you have decided which label is right for your product, it’s important to find a reputable Label Printer to partner with. Rebsons Labels has more than 50 years experience in the Label manufacturing business and can offer the best labels, service and price. Contact Rebsons Labels today for a quote on your label requirements.